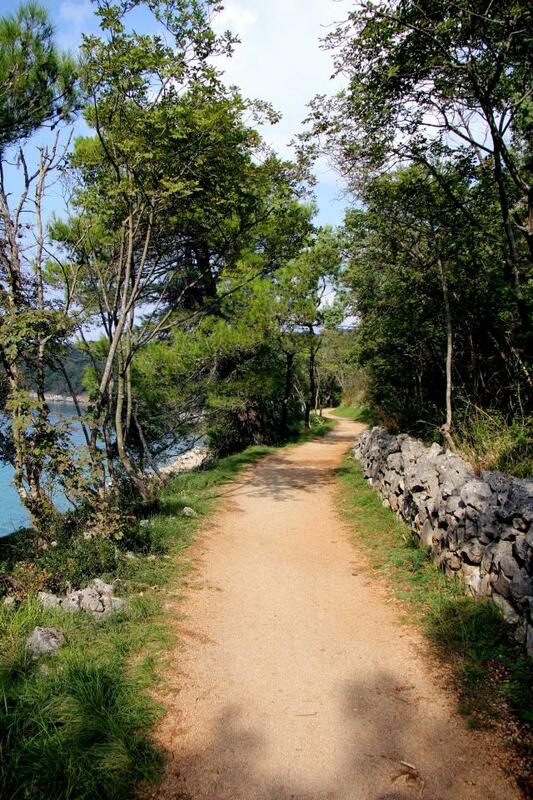 If you are a fan of running, walking, peace, nature, positive energy and confident enough to accept a bit of diversity, we strongly recommend you to visit this beautiful paradise road. 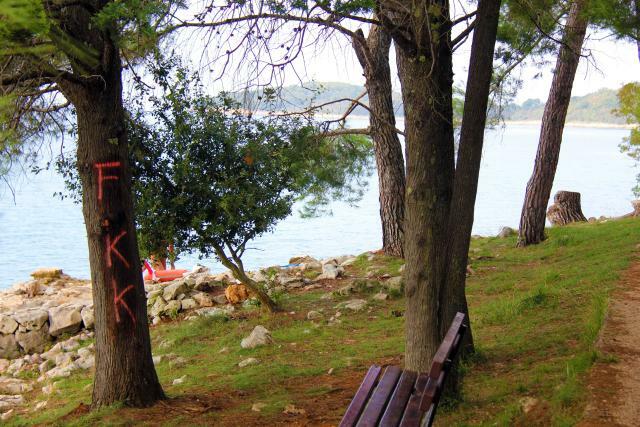 You have probably already heard for the town called Malinska? In this town there used to be world famous hotel resort named Haludovo. In the late 70th this was a vacation destination of many world known rich people, among others Hugh Heffner and his elite were a really good costumers. When the hotel went in debts and could not maintain itself anymore, people stop coming and there was no more future for this amazing resort. It slowly collapsed. Haludovo felt into oblivion, and at that time the most prestigious complex is now days only a memory with some sad residues. Luckily for us, in the shadow of Mediterranean plants, remained something wonderful. There is still paradise beach and next to the beach, leads a wonderful paradise road. Access towards the beach is fairly easy. If you are arriving by car, just before entering Malinska, you need to turn right towards the Haludovo. You pass, now abandoned and destroyed hotel complex and then go until the end of the road and park your car in the shade next to the old restaurant. Go down towards the sea and turn right, as you arrive to the beginning of nicely maintained road, in width measured about two meters. Before you there is about a mile and a half long, fantastic heavenly path. The whole walking path or how the Italians call it the “promenade” is surrounded by thick pine forest on the right side of the path, while on the left side, the entire length of the path can be accessed to the sea. Beaches along the way are mostly surrounded by pretty sharp rocks, so it is necessary to walk a bit and find a nice spot, where you can put your towel or a chair. Well, there are quite a few pleasant locations with charming small beaches, but in the season they are usually already occupied in the early morning hours. Access into the sea at some areas is not exactly effortless, so people had spoken about this issue many times, they’ve expressed a desire to build a staircase to make the entrance into the sea more pleasurable. Even in the heart of the season you won’t see many activities going on at the beach. There is no showers, kiosks with food or drink, the beach is wild and it is so for a reason. Some people just want to enjoy some peace and that is totally fine. So if you decide to go on this beach I recommend that you take some water and food with you. The major part of the beach is unofficial nudist beach, where nobody will blame you if you will take off all of your clothes, but do expect that along the road there will be many people walking around, couples, individuals (dressed and naked). Towards the end of the paradise road, the road becomes more “wild” and walking on it becomes a little bit more challenging. The following mile along this route is the so called gay beach as well as beach for swingers who want a little more privacy. The vegetation on that part is as well a bit more dense, which protects the beach from the views and it provides more pleasant contact with nature. Paradise road is great for jogging or for walking. While I was walking on it, I really relished this peaceful meditative feeling, which was contributed by this unspoiled nature. The pine forest was releasing those aromatic scents which were soaked together with the salty fragrance from the sea. 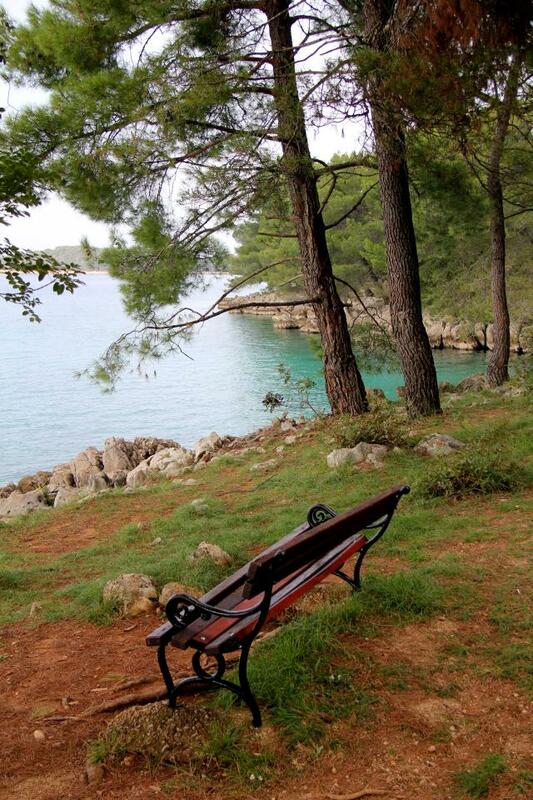 Along the path you can see a few wooden and stone benches where you can sit, relax, take a deep breath and really enjoy the sight of blue, green sea. Go into the oasis and embrace the mighty power of nature, let the gleaming sun that penetrates through the leaves and twigs, gently heats your body. I believe that this quiet path and beach destination is as well a spot for people who meditate and therefore emit even more special, positive and calming energy on that place. If you are a fan of running, walking, peace, nature, positive energy and you are confident enough to accept a bit of diversity, and are not afraid of naked people, I strongly recommend that you visit this wonderful “path of Eden” – “rajski put” or as we call it paradise road.